They say the medium is the message, but in the new news business that old saw is getting flipped: messaging is the new medium. Readers are fatigued by apps, especially news apps (people use fewer than two on average), and they’re getting overwhelmed by the torrents pushed out on social networks. What newsrooms (and brands) worldwide are realizing is that the place to reach readers these days are messaging apps. Chat platforms such as WhatsApp, Viber, Facebook Messenger and WeChat already reach more than 2 billion people worldwide, a bigger audience than the top four social networks. Time spent messaging has surpassed time spent social networking. The more forward-thinking newsrooms get this. Quartz has launched a new app that turns news consumption into a conversation. It’s fun and different, but, again, it asks you to download yet another app — a dubious prospect. A better idea is to distribute and engage on platforms that already have tens or hundreds of millions engaged. Buzzfeed is using the chat app LINE in creative ways, the Huffington Post is connecting directly with readers with Viber’s Public Chats and the Washington Post is publishing quizzes and games on Kik. The BBC, which is blocked in Iran, launched a channel on chat app Telegram in conjunction with its BBC Persian service and within two weeks had more than 100,000 subscribers and, according to BBC World Service mobile editor Trushar Barot, some posts have reached more than 800,000 unique readers in the app. 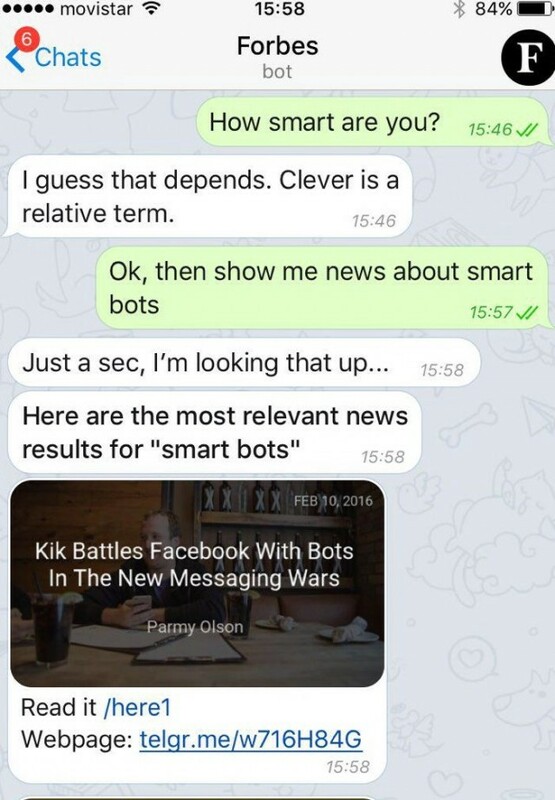 So when the founders at Chatfuel offered the chance to launch a newsbot on Telegram, we said sure, why not? It’s an opportunity to do a little experimenting in someone else’s (rather big) sandbox and let readers engage with our stories in a whole new way. The Forbes bot goes live today. This link will let you subscribe to the bot directly if you already have Telegram installed on your phone or desktop, or lead you through the download process if you don’t. 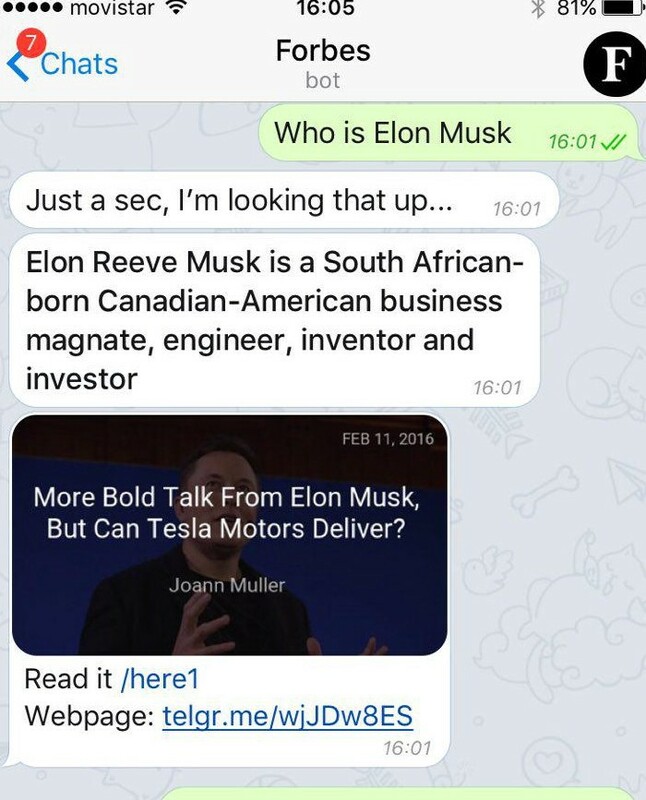 Anyone already familiar with Telegram can search from their contacts page for Forbesbot and subscribe from there. Here’s a screenshot of the bot in action. The bot is automated, no editors involved. Once you subscribe you get a handful of our most popular stories pushed to you twice a day, and you can subscribe to any of our news channels (tech, business, investing, etc.) or type in any search term to pull up recent, relevant stories. You can then follow these news topics and if we have new stories you’ll get these pushed to you when they publish. The bot can handle some light conversation, but I wouldn’t put it to the Turing test any time soon. What we like about Telegram is that it’s super fast and works across nearly every computing platform: iOS and MacOS, Android, Windows Phone and Windows desktop and Linux. The app’s growth is rather astonishing. Only two and a half years old, it has 100 million active users globally and without raising a dime of venture capital or spending any money on marketing it is adding more than 350,000 new users per day. We’re hoping our Telegram bot will help us reach a new audience. (I already got a note from a reader in Croatia who’s new to Forbes.) Many of our readers are in English-speaking countries, but a large portion of Telegram users are not. The app’s distinguishing feature is its “secret chat,” a conversation mode with fairly strong encryption that makes that app popular in more repressive countries such as Russia, Indonesia and those across the Middle East. Lots of news outlets in these countries are already amassing sizable audiences on Telegram. News has to go where the people are. Sometimes that happens without humans getting too involved. If you get a chance to try it out, let us know what you think. "He's one of the best people. Ever." - my mom. Priors: Tribune Interactive, @HyperloopOne comms, Forbes. Learning to play the guitar.